Hot Air Balloon Events & Festivals! Below is a list of Hot Air Balloon events & Festivals. We love ballooning and we know you will too! Get up close, and witness how they are assembled, watch them breath life as their vibrant colors fill the ground as far as the eye can see. 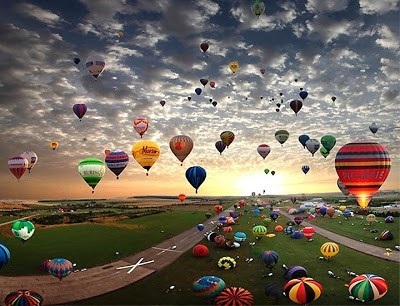 Watch them take off in a a mass hot air balloon ascension. Watch 600 to 800 hot air balloons gently float through the sky like airinotical jelly fish! We will keep this page up to-date with up and coming balloon events & festivals and as always you can subscribe to our blog for up and coming specials and events. This is always updated and it does not matter where you are in the world, there is a balloon event going on! We will not slam your email with spam emails. Please bless us with your attendance, come and say hello. We can’t wait to see you!